Contains hundreds of cheats and solutions to many Mac games. Is there a better alternative to Codebook? Is Codebook really the best app in Gaming Tools and Utilities category? Will Codebook work good on macOS 10.13.4? The Codebook is a large database of Mac only game cheats, codes, walkthroughs and strategy guides. 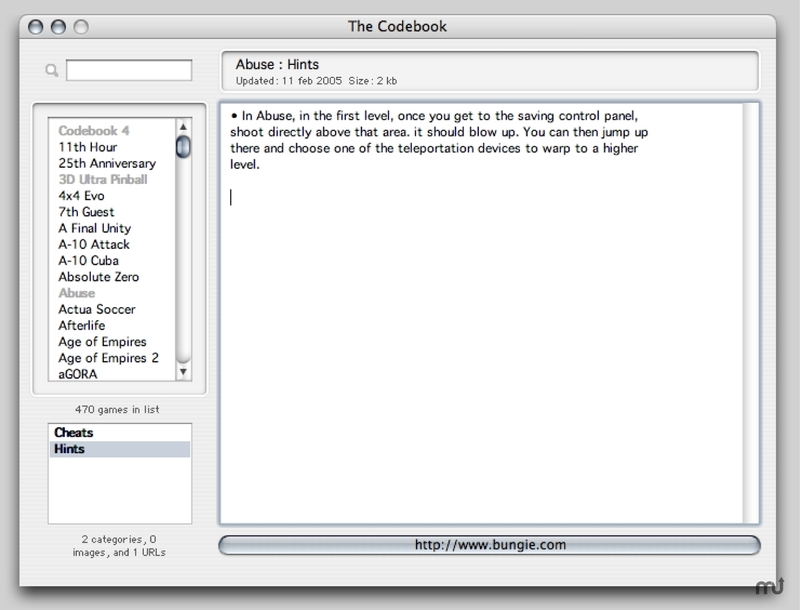 With over 500 titles, the Codebook is the biggest collection of Mac-specific unique material, and is a must for any hard-core Mac gamer. Once you've tried the Codebook, you'll ask yourself how you ever managed without it! Created by Robert Edvardsson, former chief-editor of the classic Mac gamers' site "Mac Game Gate" (MGG). © The Codebook Team 1995 - 2005. Version 4.5.2 adds new titles: Lego StarWars, StarWars battlefront, Starwars Galactic Battlegrounds, Railroad Tycoon 3, The Sims 2, Warcraft III, Homeworld 2 Tropico 2 and Journeyman Project 3. Codebook needs a rating. Be the first to rate this app and get the discussion started!